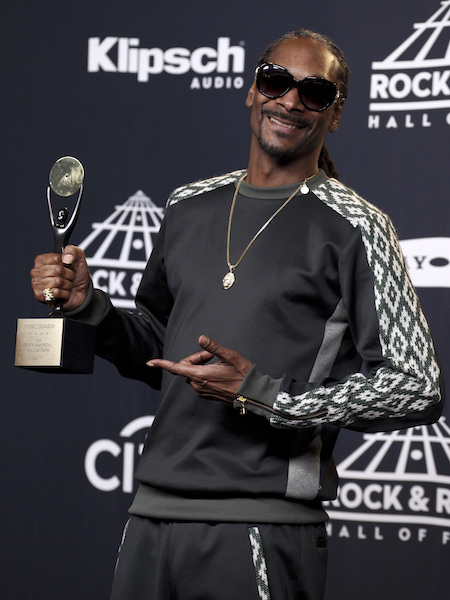 NEW YORK (AP) — Seattle rockers Pearl Jam, the late rapper Tupac Shakur and 1970s hitmaking band Journey were inducted into the Rock and Roll Hall of Fame on Friday night. Letterman wasn't the only fan in the room: As Vedder thanked his wife during his speech, one male fan from a seat up high screamed, "I love you, Eddie!" "Shoot, honey, I thought you were sitting down in the front," Vedder said to laughs. Vedder also used his speech to discuss climate change, saying "climate change is real, that's not fake news." He also said his daughter Olivia was a big fan of Chance the Rapper, and thanked the Grammy-winning hip-hop star for his charitable contributions to Chicago. Speaking of rappers, Shakur — who died in 1996 — was remembered by Snoop Dogg with a touching and playful speech. Dogg, a former label mate and friend of Shakur, says he attended the event to make sure the rapper, actor and poet is remembered as a "strong black man that stood for his." Dogg, a marijuana enthusiast, also says it was Shakur who first gave him weed. "That's right — Tupac got Snoop Dogg smoking blunts," he said to laughs from the audience. Later, Alicia Keys performed a medley of Shakur's songs on piano, including "Dear Mama" and "Changes." One of the night's most anticipated performances was Journey's. But despite earlier reports, Steve Perry did not perform with the current Journey members. Instead, Arnel Pineda sang lead as the band performed their hits, including "Don't Stop Believin'." "You're the one who put us here," Perry said to the Journey fans, earning one of the night's loudest applauses. "I've been gone a long time but you've never not been in my heart." Baez, one of folk's most iconic voices, said it felt "cool" to be inducted. She also said earning the Rock Hall honor would help young people learn who she is, and what she's accomplished. "My granddaughter had no clue who I was until I took her backstage to a Taylor Swift concert," said Baez, who added that her granddaughter took a selfie with Swift and now had "newfound respect for her grandmother." She was inducted by Jackson Browne, who said the first album he bought with his own money was Baez's second album. ELO — who kicked off the show with Berry's "Roll Over Beethoven" — and progressive British rockers Yes were also inducted Friday. "It was 49 years ago tonight I met Chris Squire at a bar," singer Jon Anderson said of the band's founding bass player who died in 2015. "Magic moment." Berry wasn't the only late legend who was honored: Lenny Kravitz paid tribute to Prince after the "In Memoriam" section with an explosive performance of "When Doves Cry," backed by a choir and beaming purple lights.